The biggest party of the year happens in Indianapolis during IBE’s Summer Celebration Weekend July 20 at THE PAVILION AT PAN AM starring the one and only DJ Kid Capri plus our special guest R & B Artist Lyfe Jennings. 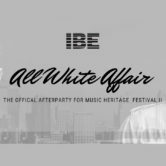 Party with all the celebrities in town for IBE Weekend! Please note that General Admission seating is first come, first serve.